Microsoft, Apple Executives Among Business Leaders Who Oppose DACA Cancellation : The Two-Way As dozens of CEOs called on the president to preserve DACA, and on Congress to pass an immigration bill to help immigrant youth, the president of Microsoft had some fighting words for the White House. Brad Smith speaks at the Microsoft Annual Shareholders meeting in 2015. The Microsoft president issued sharp words Tuesday against President Trump's decision to cancel DACA in six months and called on Congress to make immigration a top priority. "There is nothing that we will be pushing on more strongly for Congress to act on," Smith said in an interview with NPR. "We put a stake in the ground. We care about a tax reform bill. The entire business community cares about a tax reform. And yet it is very clear today a tax reform bill needs to be set aside until the DREAMers are taken care of. They have a deadline that expires in six months. Tax reform can wait." 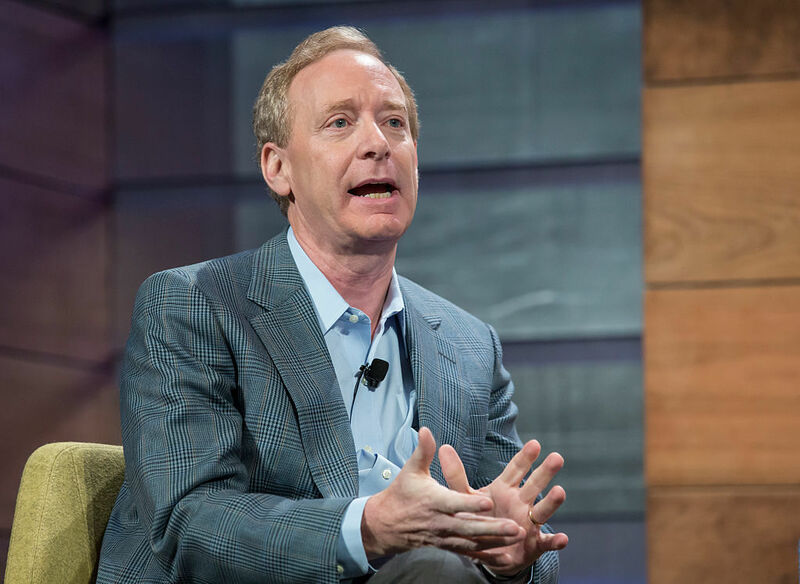 Smith also said if the government moves to deport DREAMers who are Microsoft employees, "it's going to have to go through us to get that person." There is nothing that we will be pushing on more strongly for Congress to act on. We put a stake in the ground. We care about a tax reform bill. The entire business community cares about a tax reform. And yet it is very clear today a tax reform bill needs to be set aside until the DREAMers are taken care of. They have a deadline that expires in six months. Tax reform can wait. This is the second time in a week that Smith has spoken out. Last Thursday, Smith and Microsoft CEO Satya Nadella both issued statements calling on the administration to preserve DACA. Nadella, a first-generation immigrant from India, struck a personal note: "I am a product of two uniquely American attributes: the ingenuity of American technology reaching me where I was growing up, fueling my dreams, and the enlightened immigration policy that allowed me to pursue my dreams." Meanwhile, in a letter to employees this morning, Apple CEO Tim Cook said more than 250 Apple workers are affected by the DACA repeal and that he has been hearing from them all weekend. 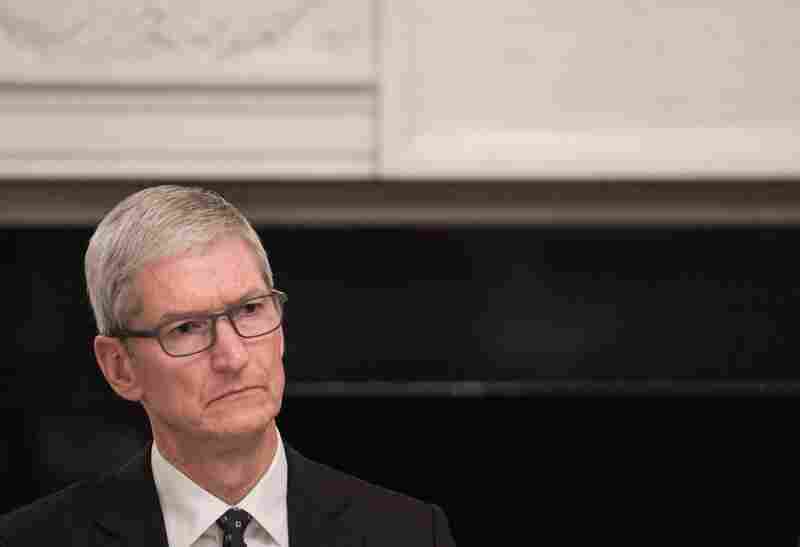 Apple CEO Tim Cook listens to a speaker during an American Technology Council roundtable at the White House on June 19. Cook is speaking out against the decision to end the DACA program, which affects more than 250 Apple employees. "I want to assure you that Apple will work with members of Congress from both parties to advocate for a legislative solution that provides permanent protections for all the Dreamers in our country," Cook said. Dozens of CEOs including Jeff Bezos of Amazon, Reed Hastings from Netflix, Randall Stephenson from AT&T and Tim Sloan of Wells Fargo wrote a letter addressed to the president asking him to preserve the program. The leaders argued that all DACA recipients grew up in America and give back to the community and pay income taxes. They said: "More than 97 percent are in school or in the workforce, 5 percent started their own business, 65 percent have purchased a vehicle, and 16 percent have purchased their first home. At least 72 percent of the top 25 Fortune 500 companies count DACA recipients among their employees." In a public post, Facebook CEO Mark Zuckerberg said about Trump's announcement: "This is a sad day for our country" and that he and his immigration advocacy vehicle at Fwd.US will be "doing even more in the weeks ahead to make sure Dreamers have the protections they deserve." Sundar Pichai, the CEO of Google (an arm of Alphabet), did not make quite the same commitment on Twitter. But he took a moral stand, writing, "Dreamers are our neighbors, our friends and our co-workers. This is their home. Congress needs to act now to #DefendDACA. #WithDreamers." When President Trump was first elected, leaders in the tech industry were reluctant to criticize campaign pledges of his that went against their values and interests. They took a wait-and-see approach and grappled with how to be a successful multinational in an increasingly nationalistic world. Tuesday morning's outpouring illustrates a clear shift in business leaders' willingness to speak out against decisions by the administration. Microsoft's Smith says in the beginning of 2017, business leaders looked around and wondered how they would navigate this new unpredictable environment. They feared being attacked by the commander in chief on social media. Now, Smith says, "I don't think people get up in the morning worrying about tweets. We have much bigger problems to worry about than that."